It's mud season in Pennsylvania. And with mud occasionally comes a variety of lovely skin infections, fungi, and bacterial nasties. Currently, Dino and I are battling a case of scratches. 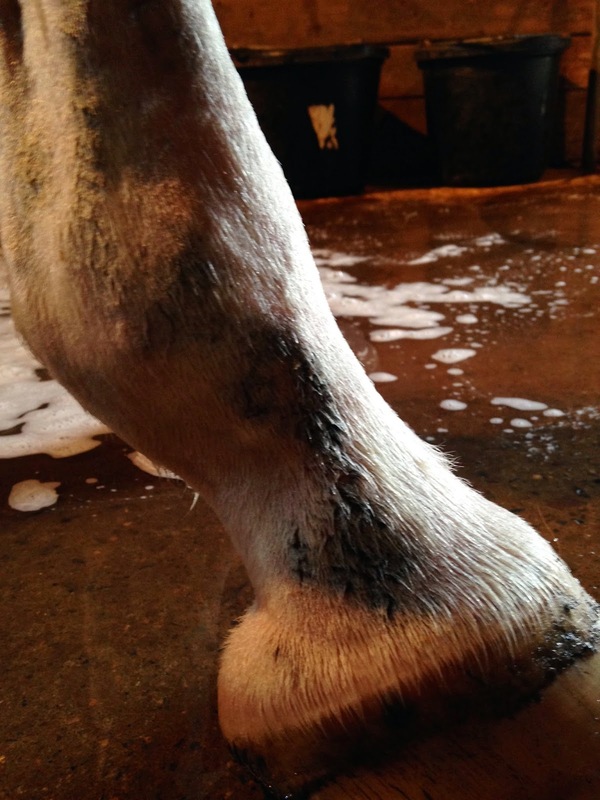 Scratches is a really common skin infection that often plagues horses who live in wet, muddy climates. 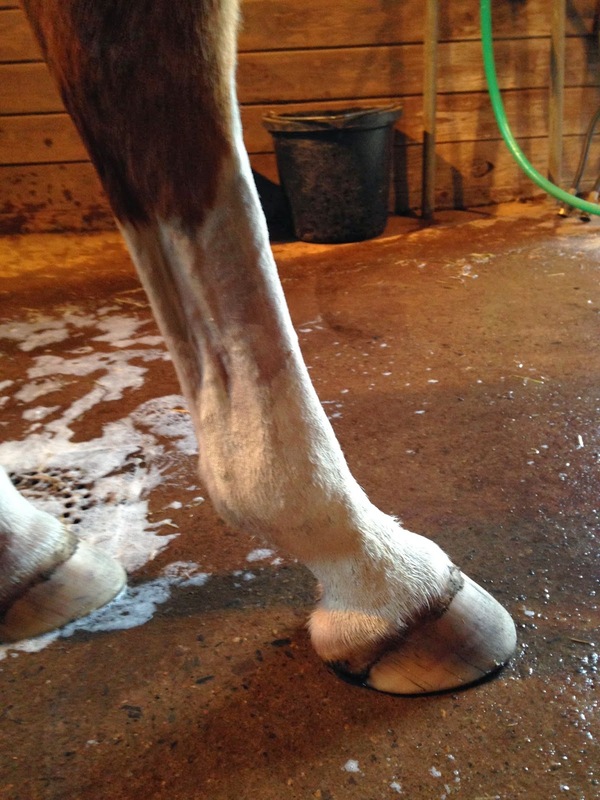 When the skin on a horse's lower legs goes through a wet-dry cycle, it gets chapped and cracked just like ours would. This cracking gives bad little microorganisms entry into the skin, and they cause an annoying infection called scratches. It looks like cracked, inflamed skin in its early stages, and as it progresses it can get oozy, black, and scabby. It's lovely, really. Normally this isn't an issue for the Greatest Pony In The Universe, but since I clipped his legs during the winter to get a better look at his weird leg lump/splinter thing, he lost the protection of his long luxurious leg locks. As a result, all of the wet, muddy nastiness that is his "dry" lot was able to come into direct contact with his delicate pink skin and cause a case of scratches. Most self-respecting horse people would tell you that the first order of business when treating scratches is to get the affected area clean and dry so that the skin can begin to heal. This is a problem for us, since His Highness lives outside, in the mud. So, how are we supposed to treat a skin infection caused by wet and mud, when we can't get the pony out of the wet and mud?! Wash and disinfect the legs. My preference is to use shampoo or dish soap mixed with Betadine solution. 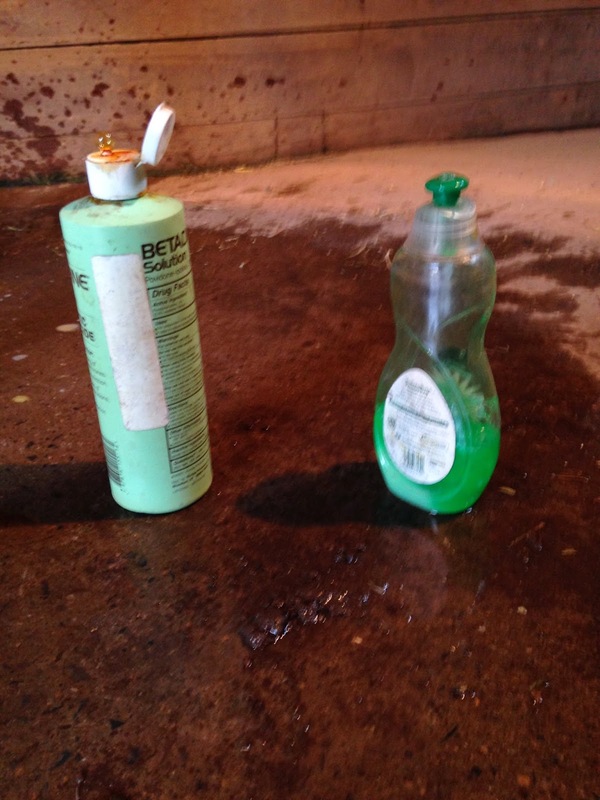 I'll choose the dish soap if Dino has an accumulation of greasy ointment with dirt stuck to it on his legs already, since it cuts through the gunk a lot better than your standard horse shampoo. Betadine is a disinfectant that will kill any creepy crawlies hanging out on his skin. You can also do pre-mixed Betadine scrub, Nolvasan, or Clorahexadine. Whatever floats your boat. I try to be as gentle as I can during the wash, since his skin is chapped and tender right now. If your horse is in the oozing/scabby stage of scratches, use warm water and try and rub off the scabs as best you can. Whatever disinfectant you choose needs to get UNDER the scabs in order to be effective. We are, thankfully, beyond that point. Once the legs are clean and rinsed well, dry them off with a towel. Really dry them. Get them as dry as you possibly can, yo. If you have the ability to use a hair dryer, do that. The skin should be as clean and dry as possible. At this point, you have a few options. If you're just starting treatment, you need goo that's going to kill the bacteria and/or fungus living in your horse's skin. Antibiotic ointment, anti-fungal ointment, furazone, ichthammol, or various home-made mixtures of several of these products can be used. If you're not sure, ask your vet! Whatever you choose, though, it needs to be THICK and WATERPROOF, or you need to be willing to wrap your horse's leg very very well with a watertight bandage until the healing process is well on its way. I chose just to slap on a super thick layer of antibiotic ointment for this stage of treatment. The ointment I use kills bacteria, provides a water and dirt proof barrier, and also gives a little pain relief to the sore skin. I make sure to apply ointment before putting Dino out in his muddy pen, so that the mud and water stays on the other side of the ointment barrier. Once the infection starts to clear up, you can switch to something more basic instead of a disinfecting ointment. Diaper rash cream is AWESOME for this, as it's thick, sticky, and totally water repellant. Vaseline also works. Essentially, you want something that will soothe and protect the skin from mud and water while it continues to heal. And that, my friends, is how you treat scratches when you can't lock your pony up in a soft, fluffy, dry stall until it heals. My friend's Clyde and Percheron get scratches all the time during muddy weather. She swears by this stuff and it has been the only thing that works with her boys. Hope your boy heals up soon and that this mud goes away! We used medicated powder like generic gold bond last summer. Got lucky this winter because Dottie is part of a trial for Hilton Herbs specifically for mud fever. When it comes out I would definitely recommend it. Thanks for the recommendations, ladies! I've also recently been told that sauerkraut is a great remedy.